Small 5 litre cooler bag with PE foam insulation encased in a waterproof PEVA inner liner. The outer construction is an on-trend combination of natural jute partnered with natural unbleached cotton carry handles. 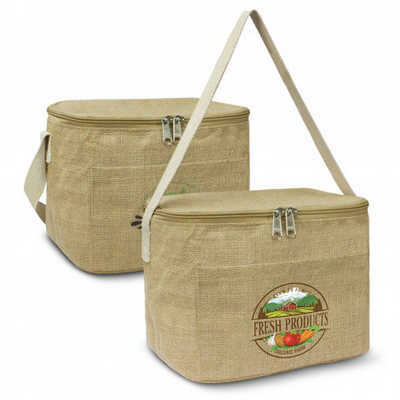 Other features include a natural zippered top closure and a jute slip pocket on the front. Colours: Natural. Dimension: H 160mm x W 220mm x Gusset 160mm (excludes handle). Print Description: Front Pocket - 120mm x 60mm. Print Type: Screen Print. Packing: Loose packed. Price includes : 1 Col 1 Pos Print. Setup is included.